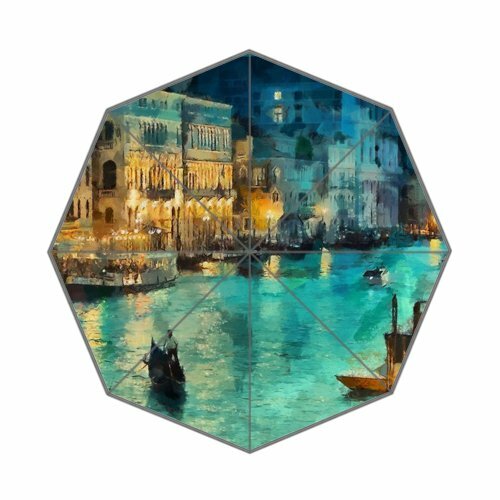 Flipped Summer Y Venice Italy at Night Painting Customized Art Prints Umbrella by Flipped Summer Y at MZ Italia. MPN: Flipped Summer Y15213. Hurry! Limited time offer. Offer valid only while supplies last. This stylish umbrella is made of 100% polyester pongee waterproof fabric, easy carrying for everyday use. Wanna be cheered up in any dismal weather? This stylish umbrella is made of 100% polyester pongee waterproof fabric, easy carrying for everyday use. Wanna be cheered up in any dismal weather? Wanna get a multifunctional umbrella but not a traditional black one? Place an order and customize your own!The focus of crowd is you! You'll be hoping for a rainy day so you can use this unique umbrella! Customize and print their own personal style, convenient and easy-to-carry for everyday use, design Umbrella is suitable for every age group, If you have any problems, please feel free to contact us. Very easy to take for travel and outdoor sports. 8 ribs made from strong fiber for extra support. Custom a cool umbrella and make you stand out on rainy or sunny days. If you have any questions about this product by Flipped Summer Y, contact us by completing and submitting the form below. If you are looking for a specif part number, please include it with your message.